Can Dietary Supplements Treat My Alopecia Areata? 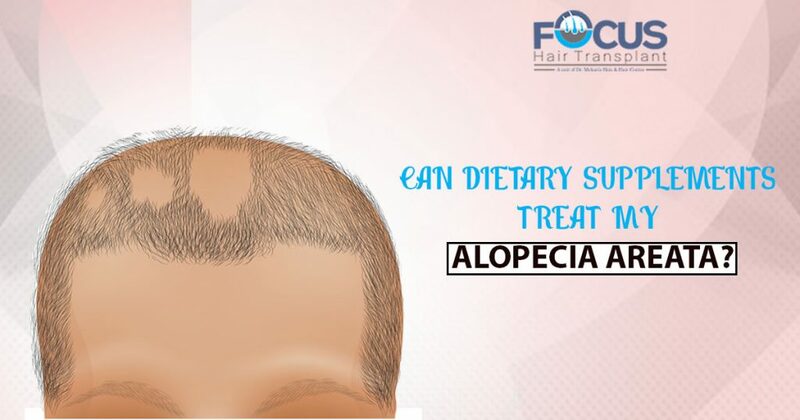 Alopecia areata is the condition of hair loss in which a person may experience the patchy loss of hair and in the initial stage; it can be unnoticeable due to loss of hair in very small patches. With the passage of time, when this condition is left untreated means if the patient does not take any Alopecia Areata Treatment then smaller patches can turn into the bigger patches and sometimes result in the total hair loss. The person may experience the Alopecia Areata Symptoms when his own immune system attacks his own hair follicles and force them to break down before their maturity. There can be various treatment options available for this condition of hair loss, but according to the experts if you will pay close attention towards this condition in the initial stage than only some dietary changes and supplements can help you to get rid of this condition and can save your Alopecia treatment Cost. As per the expert opinions for the primary stage of Alopecia dietary supplements can work. They did some experimenting to find the reality of this fact by considering the small subset of the patients affected by Alopecia Areata. Even the experts claim that over-supplementation can lead to the increase in hair loss so these supplements should only be considered with the approval of a doctor. During the research conducted in 1950, the researchers found that one mouse that was fed a diet high in egg white was having a significant decrease in the hair growth and even this growth of hair was resumed when the biotin supplementation was tested on them. In other literature search the experts found the 18 reported cases of biotin deficiency in the hair conditions and in the study, 541 women were considered, but it was found that only 38% were having the low level of biotin and the experts found that the reason for this lower level was antibiotic used, concomitant isotretinoin or antiepileptics intake and even some women were having gastrointestinal disease. Thus the researchers claimed that patients of alopecia can be tested for biotin deficiency, but it is rare that biotin supplements could help them to get rid of the condition. You can take foods enriched with biotin such as legumes, whole grains, unpolished rice, nuts, and egg yolk in your diet rather than considering the supplements. Even the celiac disease and the relation of alopecia areata was also tested and it was found that two-thirds of patients having alopecia areata and celiac disease and they come out from their issue when were given a gluten-free diet. Thus, as per the study gluten-free diet is beneficial only if the patient has celiac disease. Similarly, contribution of the dietary supplements for the alopecia was also tested for the deficiency of Vitamin D as in the study it was found that in adults and the children with alopecia areata there is a deficiency of vitamin D but there has been nothing positive relation proved between the vitamin D supplementation and the growth in hair. Thus as per the experts, you can consider supplements but with the green signal of the professionals.